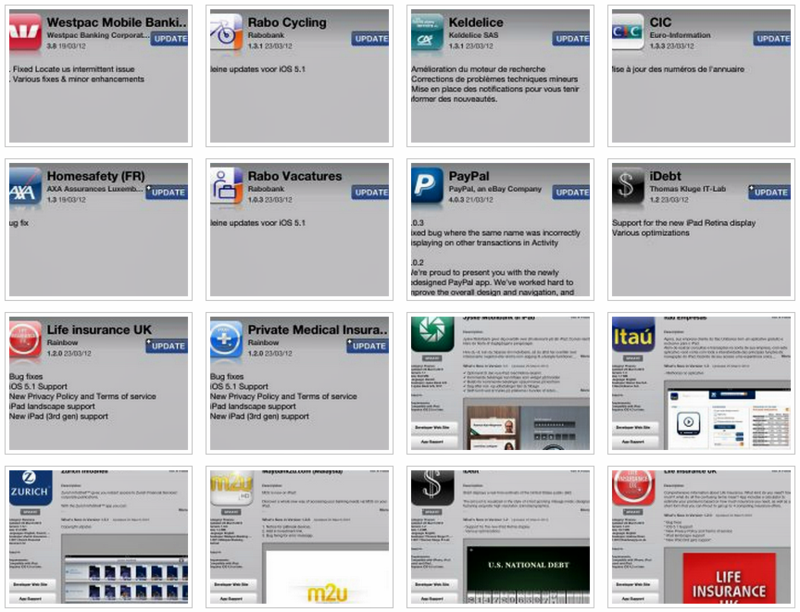 Despite being a recent owner of an iphone and a new ipad, I’ve already installed dozens of financial services apps on my devices. On regular basis, I will share with you a list of the latest application updates for iOS from banks, insurance, cards and payments and investment companies all over the world. I have recently switched from a blackberry to an iPhone 4S and I must admit that I really enjoy using the latest Apple smartphone. On 16th March, at about 7pm, I walked in the Apple store ‘White City’ in London which had still a good amount of new iPads in stock. I decided to go ahead and entrust Apple once more with my very first purchase of a tablet. Please note that I am not an Apple enthusiast by any means, and I still enjoy my laptop PC at home. I installed a fair amount of iOS apps on my iPhone and iPad in order to keep abreast of any new updates and spot any major, ideally innovative, enhancements. I aim to post regular updates on the Visible Banking blog. Please find my list of updated apps between 19-25 March 2012. I invite you to check out what every single of those updates is about. Have you already tried any of those upadted apps? Any initial feedback yet? Today in Private Equity pulls deal news and longer articles from publications, journalists, analysts, and banks who publish across the Web. The App continuously monitors and adjusts online source lists to include new analysts and publications as well as opinion leaders of note.The App’s user interface is beautiful and makes it easy to read articles and research on the iPad, simple and efficient. This is a great App for collecting and reading all this content into one place. It is the onlygoodPE related App on the iTunes Store.